Onset of summers , calls for a variety of food that is lighter, fresher, cooler and keeps your body hydrated.One such thing that is a must, specifically in summers is Yoghurt/ curd /dahi. 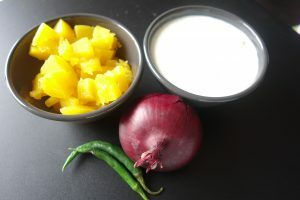 It is one of the best probiotic and full of calcium and healthy nutrients.You can have it as is, or make it much more yummier , and healthier by making variety of Raita’s using different vegetables and fruits.Also making raitas is a great way to sneak in some healthy vegetables and fruits in your little ones diet. Talking of that, one vegetable(or fruit ) that I used to dislike as a child was pumpkin. And my mum being the clever cook she is (I guess it is the children who make their mums clever 😉 ), she somehow used to sneak in vegetables in my food, without me being able to see it, and I was happily eating the things that I did not like! She used to cook yummy pumpkin parantha, pumpkin halwa, and pumpkin raita.. and I used to relish these things thinking these, as some nice variety of food, and the name “pumpkin” was always left out. But really as I grew up,and got to know the truth, I started understanding and even liking these things . 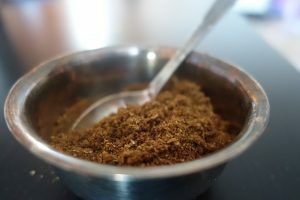 So one pumpkin recipe that I’m going to share with you people today is the “Pumpkin Raita recipe”.It is really a very very simple recipe and you can make alterations as per your tastes.Requires really few ingredients- Pumpkin/ Whisked Curd (yoghurt/ dahi), onion, chillies, coriander and few dry spices. 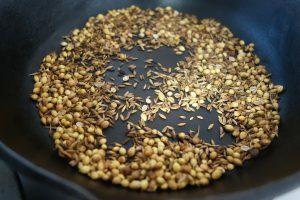 And as per my mum, the secret ingredient for all raita’s is the roasted cumin and coriander seeds powder.Roast a handful of both and let them cool. Then grind these into powder. You can even roast a big batch and, then store it for using later. In India we used to have home made curd, so that was always one thing unmistakably present in the fridge. Here in UK, as I do not have the homemade curd always ready, I sometimes use the organic greek yoghurt to replace the homemade curd.It tastes as delicious. If you feel the consistency of the curd is too thick, you can add a little cold milk to adjust that. 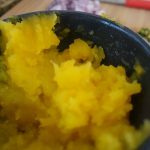 I used boiled and roughly mashed pumpkin , but if you are making this for the kids, you can make a smooth paste/puree of the boiled pumpkin and then mix in the curd, and leave out the onion altogether. 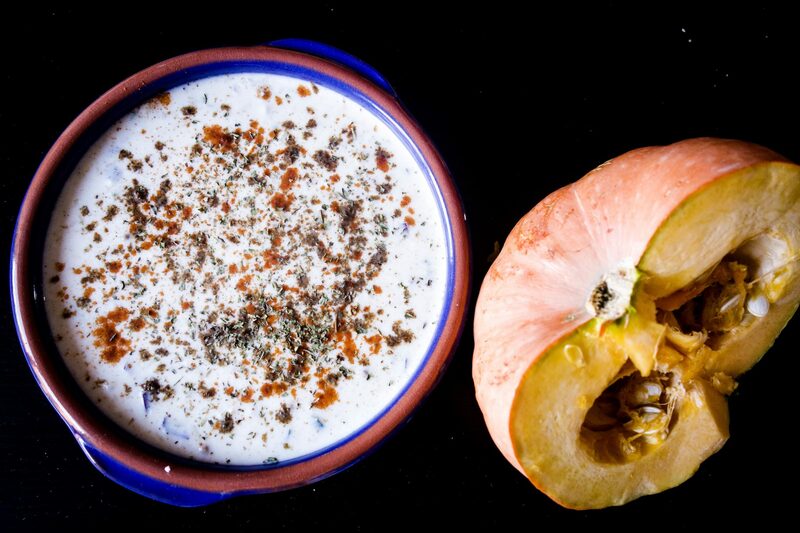 So lets taste this creamy ,sweet and spicy blend of Pumpkin raita. Boil the sliced pumpkin for 5-7 minutes, till it becomes tender. You can even steam it instead of boiling, for 10 minutes. Now strain the pumpkin slices, strain any excess water and roughly mash it. Add all the ingredients to the whisked curd/ yoghurt- mashed pumpkin, chopped onions, chopped green chillies, chopped coriander and mint leaves, coriander cumin powder, whole cumin seeds, salt, black salt,red chilli powder. 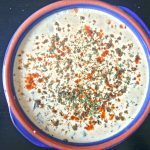 And garnish it with chilli powder and coriander cumin powder.Chill it in the fridge for some time, and serve the chilled raita with lunch or dinner, or just have it as a healthy snack/ salad option. Instead of slicing the pumpkin, you can grate the pumpkin and the boil it. But in that case just squeeze the water nicely before using it for the raita. Just incase you do not have fresh mint leaves, you can even use dried mint leaves, which are easily available in the asian stores.Mint really adds a very fresh flavour to any raita. If you are making this for the kids, you can make a smooth paste/puree of the boiled pumpkin instead of roughly mashing it , then mix it in the curd, and leave out the onion altogether.